At least two people are dead and 150 injured after an explosion at the Escambia County Jail in Pensacola around 11 p.m. Thursday. Both prisoners and corrections officers were among the wounded. The city was walloped by severe flooding earlier in the day, and it’s unclear if that contributed to the gas explosion at the facility. Read more in NEWS. 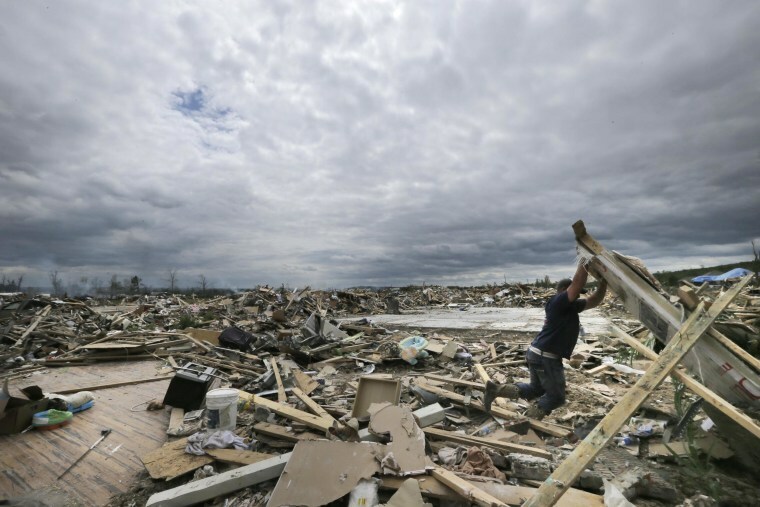 After a quiet start to the tornado season, a slow-moving storm system wreaked havoc this week from the Plains to the South, causing major flooding in Florida and spawning deadly tornadoes in Arkansas and Mississippi. At least 38 people have died in eight states. And the worst of the season could still be coming. Read more in NEWS. Gov. Mary Fallin has pledged a state review of why Death Row inmate Clayton Lockett ended up gaining consciousness during his execution Tuesday night — only to die of a heart attack after it was stopped. The White House agreed that Lockett’s execution via lethal injection was inhumane. Read more in NEWS. The owners will hold a meeting today to discuss the next steps for getting rid of Sterling, the Los Angeles Clippers owner caught on tape making racist comments. NBA Commissioner Adam Silver has already banned Sterling for life from games and fined him $2.5 million. Forcing Sterling to sell his share in the team would require three-fourths of the league’s owners to vote against him. Meanwhile, other big names, including Oprah Winfrey and Matt Damon, have reportedly expressed interest in having some ownership of the Clippers. Read more at NBC SPORTS. Ford announced Wednesday he’s taking time off from his mayoral duties and political campaign to seek help for his alcoholism. “I have a problem with alcohol, and the choices I have made while under the influence,” Ford said in a statement. His decision comes just as new video surfaced of him appearing to get high on Saturday at his sister’s home. Read more in NEWS. Could a new report set to be released today by Malaysian authorities shed any light on what happened to Malaysia Airlines Flight 370? No debris has been found, and possible underwater “pings” coming from the black boxes haven’t been located. The submarine Bluefin-21, meanwhile, is continuing to search a swath of the southern Indian Ocean. Read more in NEWS. Someone was feeling hot — and bothered. A Los Angeles television reporter covering the wildfires Wednesday got an offer she wanted to refuse: A shirtless man holding a dog offered to go out with her. “Wow, you’re super pretty, you wanna go on a date sometime?” he asked. Keeping her cool, KTLA reporter Courtney Friel tried turning the subject back to the fires, reminding him that he was live on the air.